Search for all "IL18BP Lysate"
The protein encoded by this gene is an inhibitor of the proinflammatory cytokine IL18. This protein binds to IL18, prevents the binding of IL18 to its receptor, and thus inhibits IL18-induced IFN-gamma production. This protein is constitutively expressed and secreted in mononuclear cells. 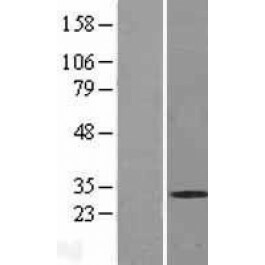 The expression of this protein can be enhanced by IFN-gamma. An elevated level of this protein is detected in the intestinal tissues of patients with Crohn's disease. Alternative splicing results in multiple transcript variants. [provided by RefSeq]. Transcript Variant: This variant (E) differs in the 5' UTR compared to variant A. Variants A, E, F and G encode the same isoform (a, also known as IL-18BPa). Publication Note: This RefSeq record includes a subset of the publications that are available for this gene. Please see the Entrez Gene record to access additional publications.